A disruptive and most probable crisis for you and your family could result from a simple power outage and thus you have no way to prepare (i.e. cook/heat) your meals. 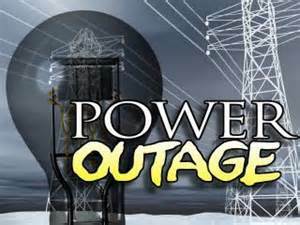 Most power outages last for about 1 – 3 hours, some as long as weeks. If you have no cooking capability outside of your normal appliances then you could be in for a rough ride. In my last post in this series (FOOD: Part 3 – Pantry Food) I shared with you how important it is to have normal every-day-food sitting in your pantry. You will always use it, it is just a matter of time. So buy it on sale and get it in the pantry. So you do need options to provide decent meals to your family during short-term emergencies. Granted, if you have a BBQ grill that is an option. But ask yourself…Do you know how long will your propane tank last before it needs refilled? Will you be able to get it refilled? Have you ever seriously considered grilling in the dead of winter? Do you have a back-up propane tank (or 4) that is kept full? Do you have a natural gas stove? What happens if the gas is disrupted? If you have an electric stove – you are just plain out of luck. What if you don’t want to draw attention to yourself by lighting up the grill? Or worse yet, some big cooking fire? Or what if you don’t want to draw attention to yourself by the aroma of hamburgers and ribs cooking on your grill? What if you are having to relocate and can’t take a grill? Or you’re traveling and don’t have time to fix a cooking fire, etc.? Sorry about all the questions, but as you can tell, I am trying to stimulate you to really question your situation and your Normalcy Bias. To solve this issue I believe in short-term emergency food storage made up of MREs and freeze dried food pouches. Layer #1 – MRE’s. Yup, good old fashion military grade MRE’s. You can take them anywhere, including a backpack. They are 100% self-contained, including the heat source. They are nutritionally balanced, packed with calories and sometimes include treats like M&Ms and Skittles. Very hard to beat! 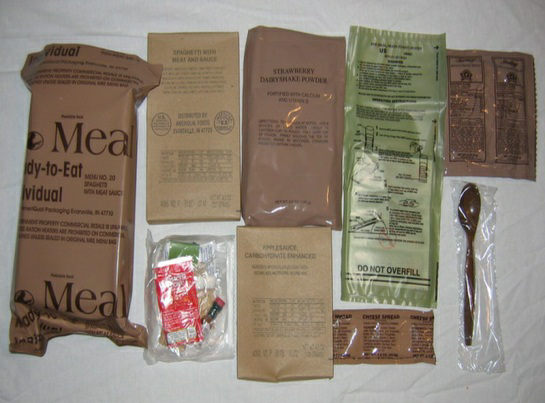 But MRE’s have distinct drawback – they tend to produce constipation when eaten for any length of time. If you are in a combat or hunting situation, that might not be a bad thing when compared to the alternative. However, under normal situations constipation is probably not high on your Christmas wish list. I have discovered a miracle cure for that unfortunate condition – granola bars. I pack 2 granola bars with every MRE, a soft/chewy one and a crunchy/hard one. Eaten for breakfast and the main part of the MRE at lunch, they keep your system moving along..
Layer #2 – My next layer of food storage preparations is just a little more complex but far tastier, bordering on a fancy feast…Mountain House meals in the pouches. Why Mountain House brand? Those are the ones I really like the best. Easy to store with a long shelf life. You can eat them right out of the pouch. A little dry to be sure but you can do it. Small, you can put them in your backpack with no problems. A cup of boiling water and you have a gourmet meal. You can eat with only a spoon or better yet…a spork. So you might be thinking about now how much of this food category should you have on hand. And that is truly a great question with no single standard answer. I could give my basic answer “As much as you can afford” or “You can never have too much” but that would be lame and avoid providing a realistic solution. But it is a matter of priorities. But…think about 3-days worth of MREs and meal pouches for each person in your house. A case of MREs contains 12, so think a case per person. It will cost you $50 – $75 per case. 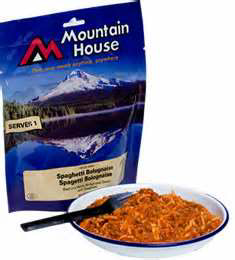 Then 3-days of Mountain House pouches consisting of a breakfast, lunch and dinner for each person. 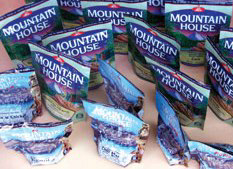 Each pouch of Mountain House will cost you between $5 – $7 each. 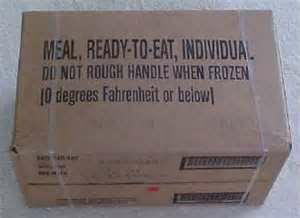 I would get the MREs first because they have a water-activated heater in them to warm your food. If times were bad you could cut back on how much of them you ate and they could easily last twice as long if it was needed.